Overwatering is ubiquitous in agriculture. Whole fields are grossly overwatered to ensure that no single plant experiences water stress. Farmers typically overwater their crops by 20-50% as a precautionary measure6. Higher yields and low water costs make this behavior rational. However, recent improvements in water sensors and precision irrigation will make it possible to significantly reduce agricultural water use while maintaining yields. According to the World Wildlife Fund, agriculture consumes 70% of the planet’s accessible freshwater1. For comparison, 8% of water is used municipally for drinking, sewage and industry. In water strained regions like California, Northern China, and Pakistan, increasing agricultural and municipal demands compete for a finite waters supply. Another impact of overwatering is agricultural runoff. When soil is oversaturated, the resulting runoff carries environmentally hazardous pollutants and fertilizer into local water systems. Fertilizers consist of nitrogen-based compounds that are harmful to freshwater ecosystems. This runoff also depletes soil of its nutrients, further exacerbating the need for fertilizer. Precision irrigation systems exist and can substantially reduce agricultural water use; the current bottleneck for these systems is soil moisture data. Without corresponding moisture data the water savings for these systems largely go unrealized. The soil moisture sensors that exist are either too costly, obstructive, or too inaccurate to use in conjunction with precision irrigation. In the following section we describe these limitations. The two primary solutions for soil moisture data have been capacitance probes and satellite imaging. Capacitance probes are the industry standard for taking cheap, accurate soil moisture measurements; however, capacitance probes require a continuous supply of power and often need to be checked manually. These sensors are relatively cheap but installing the number of probes necessary for a precision irrigation grid is costly. For these reasons capacitance probes are impractical for large area moisture sensing. Satellite imaging is a cost-effective solution, but the results from these images come sporadically (less than once per day) and have low granularity (measure on a hectare scale). For these reasons they are ineffective for managing water usage on a day-to-day basis. OPEnS RFID aims to address these issues by providing a cheap, wireless, battery-less solution to large area moisture sensing. OPEnS RFID integrates the newest advances in ultra-high frequency (UHF) radio frequency identification (RFID) technology into our sensors, which make them a fraction of the cost of other sensors. A OPEnS Sensor costs under $0.43 to produce, has performance like that of a capacitance probe, are unobtrusive to regular field work, and can last years without maintenance. These features make OPEnS Sensors ideal for agricultural moisture sensor grids. The sensors are ideally installed at the beginning of planting season (reason being moisture data is most valuable when the plants are still juvenile). They require the same amount of labor to install as capacitance probes, however, OPEnS is currently engineering a robotic planting device to do this autonomously. Once a sensor grid is planted, a drone is flown over the field to collect moisture data on a regular interval. This data is then fed into a proprietary algorithm. Once the data is interrogated, the system communicates wirelessly with the farm’s irrigation system to apply water only where it is needed. 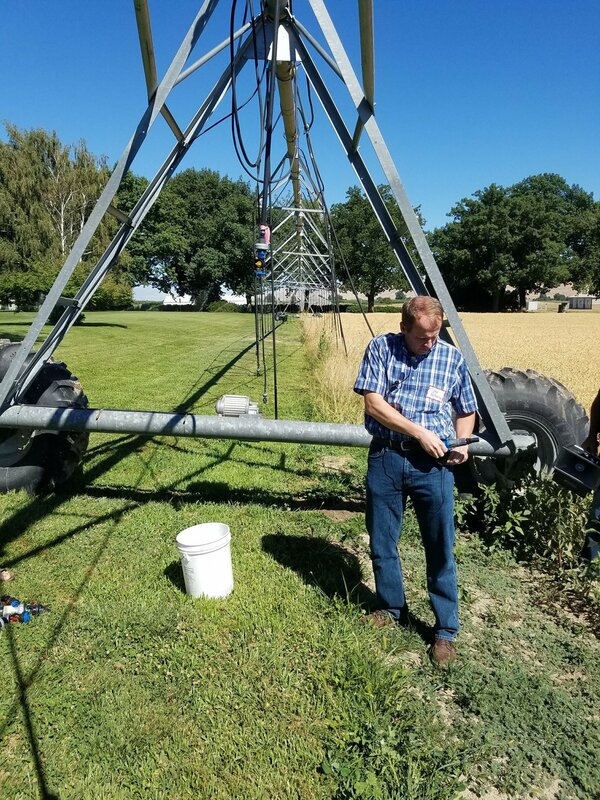 OPEnS RFID has the potential reduce water usage by 10-25% when retrofit to an existing center pivot irrigation system, the most usual form of active irrigation in the United States. In areas with high water costs, this represents a 0.2-3% increase to gross margin. In an industry of such high volume, this represents a material increase to profitability and sustainability. Moreover, the system reduces environmental impact by reducing runoff related water contamination, further reducing costs associated with environmental remediation. When a 3% water savings caused by reduction of overwatering is applied nationwide, the OPEnS RFID system could potentially save 3.45 billion gallons of freshwater per day. As stated earlier, the current status quo of soil moisture sensors revolves around capacitance probes and satellite remote sensing. To get a better idea of what makes the OPEnS Sensors unique, the following table compares OPEnS RFID to two popular capacitance probes used in industry: Meter Group’s 5TM, and DFRobot’s Gravity. We also included NASA’s SMAP, a popular soil moisture satellite used by researchers. Total Available Market (TAM): International capital-intensive agriculture. Regions that use modern agricultural practices are more likely to adopt our sensor system. To realize the full water savings, it is necessary that the OPEnS RFID System work in tandem with high-precision irrigation systems. Places and industry segments which already use applied irrigation are more likely to adopt our system. For example, center pivots can be easily retrofitted with variable rate nozzles and variable rate rotation motors to provide high precision water application. Serviceable Available Market (SAM): Agriculture in California and the Pacific Northwest. Most US agricultural output occurs between the two aforementioned regions. OPEnS Sensors would be ideal for roughly $14 billion of agricultural output. Serviceable Obtainable Market (SOM): Our first market will be focused on potato growers in Southeastern Washington and Northeastern Oregon, with a regional agricultural annual output of approximately $650 million. We plan to capture 20% of this market in the first two years of commercial production. It will be a priority for our company to get endorsed by the Potato Commission of Oregon and Washington which will greatly expedite adoption. After the system is tested using potatoes, an ideal crop, we intend to branch out to other water intensive crops with and without canopies. After the correlation was proven in the lab, the team traveled up to OSU's Hermiston Agriculture Research Center to conduct field tests. Using a portable version of the RFID reader that sent data to a companion app over Bluetooth, we read the RFID tags and moisture values as a center pivot irrigation arm passed over. Using this app, we were able to visualize the water seeping down to the depth of the tag. For the past few weeks, I've been further examining the RFID Dogbone Tags. This time I'm testing their capability as capacitive humidity sensors. This article describes the system I built to test them out. Water Scarcity.” WWF, World Wildlife Fund, 2018, www.worldwildlife.org/threats/water-scarcity. Karthikeyan, L., et al. “Four Decades of Microwave Satellite Soil Moisture Observations: Part 1. A Review of Retrieval Algorithms.” Advances in Water Resources, vol. 109, 2017, pp. 106–120., doi:10.1016/j.advwatres.2017.09.006. “SMAP: Specifications.” NASA, NASA, 2 June 2015, smap.jpl.nasa.gov/observatory/specifications/. “ECH2O 5TM | Soil Moisture and Temperature Sensor | METER Environment.” METER, 2017, www.metergroup.com/environment/products/ech2o-5tm-soil-moisture/. “Gravity: Analog Capacitive Soil Moisture Sensor- Corrosion Resistant.” DFRobot, www.dfrobot.com/product-1385.html. Kelly, J. (2016). Addressing Data Resolution in Precision Agriculture (Doctoral dissertation). Retrieved from Oregon State University. (https://ir.library.oregonstate.edu/downloads/bv73c3274). Corvallis Oregon: Oregon State University. Gollehon, Noel, et al. Water Use and Pricing in Agriculture. Economic Research Service [US], www.ers.usda.gov/webdocs/publications/41964/30286_wateruse.pdf?v=41143. “US Water Supply and Distribution.” US Water Supply and Distribution Factsheet, University of Michigan Center for Sustainable Systems, Aug. 2017, css.umich.edu/sites/default/files/U.S._Water_Supply_and_Distribution_Factsheet_CSS05-17_e2017.pdf. Topp, G.C., J.L. David, and A.P. Annan 1980. Electromagnetic, Determination of Soil Water Content: Measurement in Coaxial Transmission Lines. Water Resources Research 16:3. p. 574-582. Different ways of moving the antenna around to collect data include drones, tractors, center pivots, and rails.